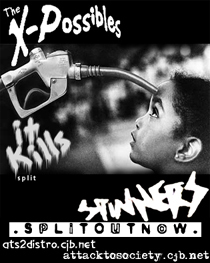 This split cd-r released in December 2003 and co-released with ATS2 Distro and DIY Label (Turkey/İstanbul). Attack to Society Distro and D.I.Y. Label supported this split cd-r as monetary. 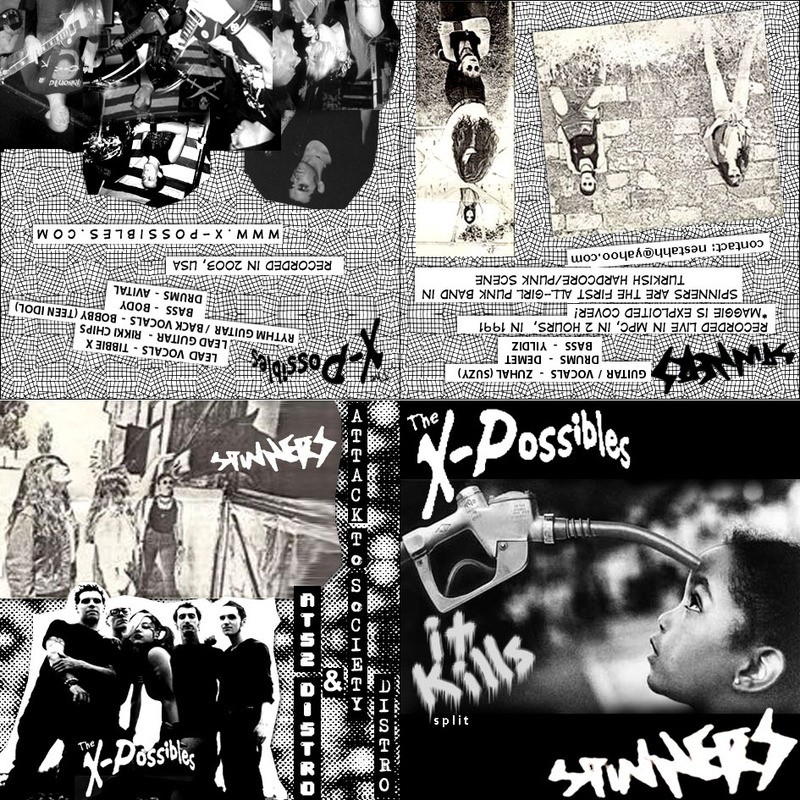 All of cover designs were made by Atilla (ATS2 Distro and DIY Label). This split cd-r was pressed black carbon cd-r. Get this split from Attack To Society Distro and DIY Label or ATS2 Distro and DIY Label for 2$. Trades and Wholesales are welcome. 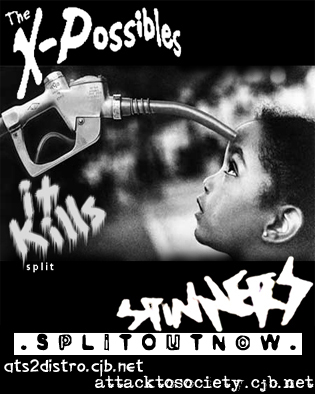 This Split Album have 3 different front covers, because we make mistakes :). Version 2 : 50 covers pressed by Attack To Society Distro and DIY Label. We decided to erase Spinners Contact e-mail, because the band is RIP and all old band members can't deal with e-mails. Attention for Distro! : This is a non-profitable D.I.Y. (Do It Yourself) Split Album. Please sell this item max 3$. 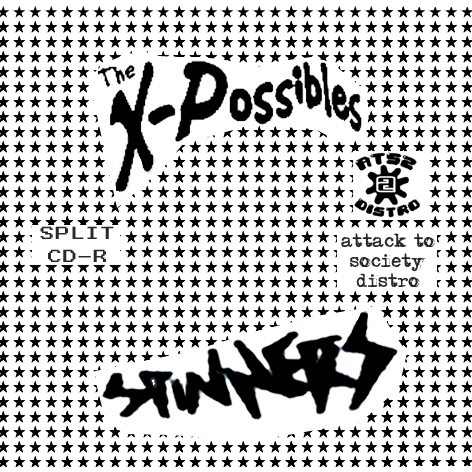 The X-Possibles is chaos punk band from New York City and have been together since 1997. The X-Possibles are Tibbie-X (Vocals - Rhythm Guitar), Rikki Chips (Lead Guitar), Aron (Rhythm Guitar), Goose (Bass) and Brandon (Drums). 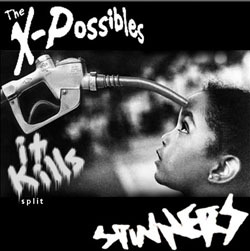 The X-Possibles are from New York City and have been together since 1997. To categorize them simply as a punk band is impossible due to their vast influences. Their music embodies lust, anger, joy, violence; all the emotions connected to being ALIVE in a world that is not so pretty. The shows they've played range from international festivals, New York City clubs and political activist venues. They've toured both the US and Europe. The X-Possibles are a band that has been able to capture and hold the attention of a vast array of audiences of all ages. The Spinners is first all girls punk band from Turkey. The band was formed in 1988 and they recorded a demo in 1991, which name is "Dig the hole forget the sun". This demo tape contains 8 tracks and all of songs are in this split cd-r. The Spinners was splited up in 1993.